Dream Prayer | 1 Million Dreams for 1 Million Teens - Club D.A.R.E. Nobody has ever done anything big for God without prayer. The Dream Catalyst Prayer Group on Facebook was launched to assist you with living at the highest level God planned for you to live. Why is that important? Because the fulfillment of your dream matters to the people God called you to reach through the manifestation of your purpose. I pray God will provide you with the spiritual inspiration and practical instructions you need to shift your life from striving to thriving. You can schedule a FREE consultation with me with to discuss your dreams, goals, and plans! *Note: On certain weeks I will be posting the teaching notes for those calls. 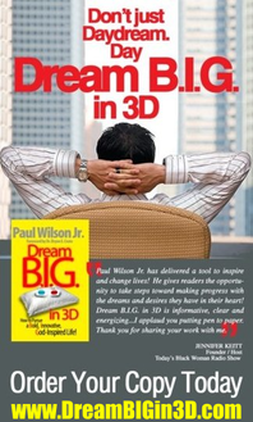 The Power to Become by Paul Wilson Jr. Mistaken Identity by Paul Wilson Jr.